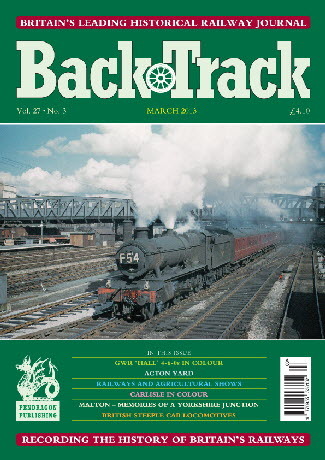 Railway Magazine | BackTrack March 2013 journal from Pendragon Publishing. To Portsmouth by Class 50 - David Cable's colour photos record the short period in the late 1980s when these locos were used on the Portsmouth Plymouth services. Railway Participation in the Royal Agricultural Shows - Jeffrey Wells looks at the extent of railway activity, particularly the Great Eastern at Cambridge in 1922. Acton - Twilight of a Marshalling Yard - Part One - Brian Ringer explains the operation and traffic of this freight centre in West London in the 1970s/80s. Malton: Memories of a Yorkshire junction 1950-67 - recalled by Tony Kirby. The British Steeple Cabs - R. A. S. Hennessey reviews an early period of electric locomotive history. Saint Pancras and his station - Peter Butler reveals who he was! At Carlisle - five colour pages at the border city's station and depots, mostly steam with a few more recent diesel locos. South by South West - archive photos of steam on the former LSWR lines in Devon, Cornwall and Dorset. Some Railway Recollections 1900-14: Part Three: Principal features of railway travel - the final part of R. E. Charlewood's survey takes in passenger accommodation, dining and sleeping cars, through trains, refreshment rooms, hotels and publicity. A Return Ticket to the Pre-Grouping Era - Clive Baker offers some observations of a journey from Portsmouth to Shanklin just before the end of steam traction on the Isle of Wight. Stationary Locomotive Testing - Part One - Adrian Tester begins this series by looking at some early test plants in the late 19th and early 20th centuries.